I played several different games at the Game Developers Conference last week, but I only ate one of them. 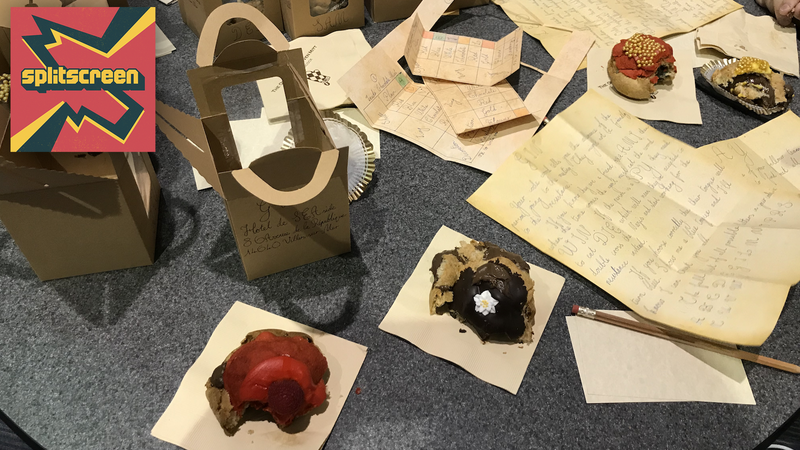 That game is The Patisserie Code, one of a series of edible games in the works by Jenn Sandercock, a designer who worked on last year’s delightful adventure game Thimbleweed Park. She came by the GDC press room to show her game to me and Jason Schreier, and we wound up consuming a lot more cream puff than we’d been expecting to. Kirk: [chewing] Wow, this is tasty. It tastes like mint? This is one of the letters that came tucked in with the creme puffs. The key to the whole thing was this puzzle matrix, which we filled in according to the clues in our letters, the toppings on our puffs, and the flavor of our fillings. The creme puffs came in tidy little cartons. These were our four options for the final puzzle. We picked right, and Jason’s mouth turned blue as a result. Sandercock’s Edible Games Cookbook will get a crowdfunding campaign later this year; you can follow her progress on her website. She gave me an early copy of the book and I can confirm that the games all look fun and delicious. As ever, you can find Splitscreen on Apple Podcasts and Google Play. Leave us a review if you like what you hear, and reach us at splitscreen@kotaku.com with any and all questions, requests, and suggestions.